Outstanding! This product went way above my expectations. My clients use this for everyday purposes, and it holds so much. Would highly recommend to others! I use this bag for everything. I can carry my computer or all my stuff for softball. Very convenient. A great bag that everyone will really be impressed with. Its versatile, and gets a ton of use. The customer service I received was impeccable. All my answers were answered promptly, and I felt very comfortable in all my interactions with the staff at Custom Earth Promos. I customized these drawstring backpacks for all our campers. Being able to present them with a useable, eco-friendly bag is a great feeling. FINALLY! This is exactly what we needed for our clients. Custom Earth Promos was recommended by a family friend, and it was the best recommendation our company has ever had in marketing! The clients always smile when they receive one of these string bags. It's the best feeling a business owner can have! Ashley was wonderful to work with and answered all of our questions. Can't wait to order again! Was exactly what we were looking for! Great quality and great service! Cory was such a big help in the ordering process. The bags were beautifully designed with our logo, and we are proud to promote our business in such an eco-friendly manner. Everything about our bulk order turned out perfect! We love the versatility of this backpack and our customers seem to love the backpacks. Love love love!!! My husband and I ordered some for our yoga studio. They came out so good! We often see our clients walking around with them outside the studio. Great product and it's eco-friendly! We will order again! We were so impressed with our order, we had to write a review! We have ordered strings bags before, and they always fell apart. Literally, all the time. These by far are the best quality bags we've ever ordered! They last so long and help advertise our business. We will be ordering again! This is the ideal product for my clients considering they are constantly on the move! A truly great promotional product! This is the perfect product for our corporate fundraiser. Not only are they a great avenue for advertisement, they are practical and recyclable. I can feel good about ordering these backpacks. I absolutely adore these backpacks! They look great on my clients! Really great product. I love how this bag is so portable. My customers use it for almost everything! These backpacks are so budget friendly but still high quality! Great company to work with. They gave me a great discount on the bulk order I placed. I love that you can try out your image before you buy. You get to make sure it's absolutely perfect before you commit to the order. Thanks for exceptional customer service CEP! Love this bag, I use it for so many different things. I take it to the beach, gym and work! Very durable. We customized the drawstring backpacks for all the kids that attend our camp. All the parents were thrilled with the idea. These are easy for the kids to use as well. I was very impressed with all the options available when customizing these eco-friendly drawstring bags. I looked far and wide and couldn't find anyone that could nearly beat the prices from Custom Earth Promos. Great way to gain some good exposure through cost effective bags. Polypropylene is a great material to use. We choose to support an eco-friendly company and this is a great one. From the beginning of customizing my earth-friendly drawstring bags to actually having them in hand was such a small time span. Very efficient process. A huge hit at the trade show. I can market my company and support the "going green" movement at the same time. The imprint looks so good on each and every bag. Sometimes the quality can be lacking on several bags, but not in this case. I worked with Ashley on my order for 8,000 of the custom drawstring backpacks. She was wonderful and really took the time to get my order situated. I really appreciate the free virtual images that CEP provided during the production of these backpacks. We were able to make finishing touches on our logo to make sure it was absolutely perfect. Thanks again CEP! 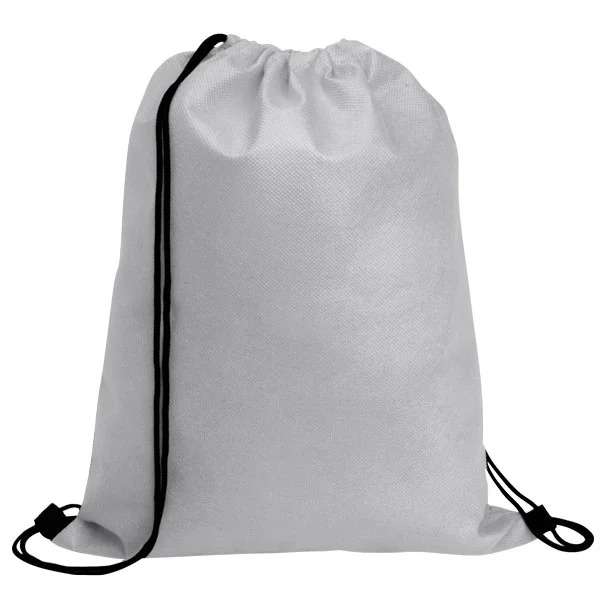 Just received my order for 15k of the custom non-woven drawstring bags. They look great. I run a summer basketball camp and these were a great addition. I customized the drawstring bags with our camp name on them. They actually helped in gaining exposure and were very useful to our attendees. We came up with a pretty unique idea for the custom drawstring bags. We opened a new sneaker boutique recently and wanted a cool, different way to advertise and also please our customers. We ordered a bunch of these bags and used them for purchased merchandise. Supporting an earth-friendly way of life too. 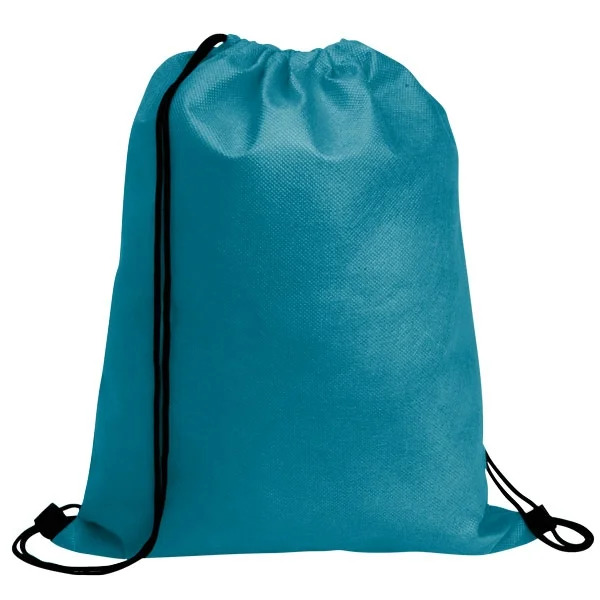 Drawstring Closure Is Great for People On The Go! 11 In-Stock Fabric Colors – Choose Any Color Overseas! 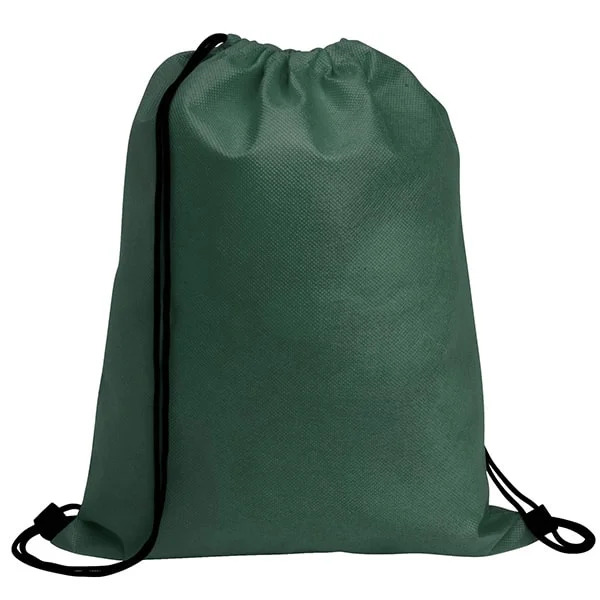 Our eco-friendly drawstring backpack is so convenient to use, it's sure to be your customer's everyday bag of choice. These reusable bags are in-stock, ready to go in 11 popular colors featuring a generous 9" wide x 9" high custom imprint area. In addition, they have a cinch closure, are made from water-resistant 80 GSM non-woven polypropylene, and our low prices will fit your budget! A must-have item for school fundraisers, recreation programs, corporate events, and yoga studios, these backpacks are made from 100% recycled materials. You will be making an eco-friendly, responsible decision by advertising on these reusable custom backpacks. The convenient design of these eco-friendly backpacks, perfect for anyone on the move, will ensure you are staying on top of today's latest trends. We offer a wide variety of imprint and fabric colors to fully coordinate with your color scheme; and best of all, our graphic designers will create FREE virtual images so that you can perfect your logo's layout before committing to buy! By creating your company's custom recyclable bags with Custom Earth Promos, you will be doing our planet a favor by reminding others to reduce, reuse, and recycle. Let us help you design a personalized drawstring backpack for your next event! If you want more options and below-wholesale prices, then ordering direct overseas with Custom Earth Promos is the choice for you. Our international factory specializes in customizing promotional reusable bags and can offer professional, high quality drawstring backpacks like no one else in the industry. The extra money you save in ordering factory-direct with us can be used to order even more custom reusable bags, or can go towards fun customization options such as mesh pockets, insulation, loop holes, water bottle holders, ID card holders, custom colored drawstrings, you name it! We can even add extra imprint colors or a FULL color, photograph-quality image to your wholesale reusable bags at a fraction of the cost to do so domestically. The ordering process overseas is worry-free as well; we send you photographs and a pre-production sample for your approval before the rest of your order is made. This way there are no surprises when your final product arrives! Best of all, your overseas order includes FREE custom trim, drawstring colors, and an expanded imprint area.